Crafting a set of standards that are at once manageable, attainable, and good for all students has been elusive. With 10 years of research and work in more than 300 schools to guide them, Strong, Silver, and Perini offer four standards that will help all students meet the various standards dictated by states, regions, and districts. Rigor: helping students make sense of challenging texts and ideas. Thought: helping students become adept users of powerful learning disciplines. Diversity: helping students understand themselves and others. Authenticity: helping students apply what they learn to the real world. 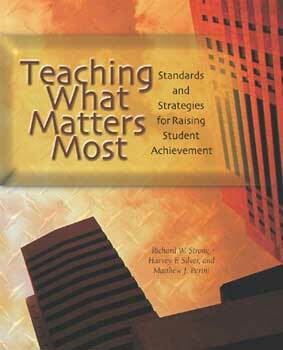 In this book, the authors go beyond simply showing what each standard looks like in various school settings. They provide research-based teaching strategies that can help all students meet each standard along with assessment practices that allow schools and teachers to respond thoughtfully to the diversity of students’ needs. Drawing from the work of educators across the country, the book demonstrates that manageable standards—when married to practical approaches to instruction and assessment—can prepare students to perform well on state tests while preserving the democratic traditions of U.S. education. Print edition: The print edition of this title (ISBN: 9780871205186) is NOT available direct from ASCD; it may be purchased through booksellers that work with Ingram's Lightning Source distribution system, including most major retailers. RICHARD W. STRONG Vice President of Silver Strong & Associates, has served as a trainer and consultant to hundreds of school districts around the world. As cofounder of the Institute for Community and Difference, Richard has been studying democratic teaching practices in public and private schools for more than 10 years. HARVEY F. SILVER President of Silver Strong & Associates, was recently named one of the 100 most influential teachers in the United States. He is coauthor of several books for educators, including the best-selling Teaching Styles and Strategies, which is used in the Master of Arts in Teaching (MAT) programs at 14 colleges and universities.